Conglomerates. (L. conglomerare = to roll together). Conglomerates are coarse clastic sedimentary rocks consisting of rounded to sub-rounded clasts larger than 2mm in size which gives the rock the appearance of pebbles cemented together. The pebbles may be of a single rock type (oligomict) or of several different types (polymict). Variation in size and rounding indicate the duration of transport and abrasion, generally considered more than for the formation of breccias. 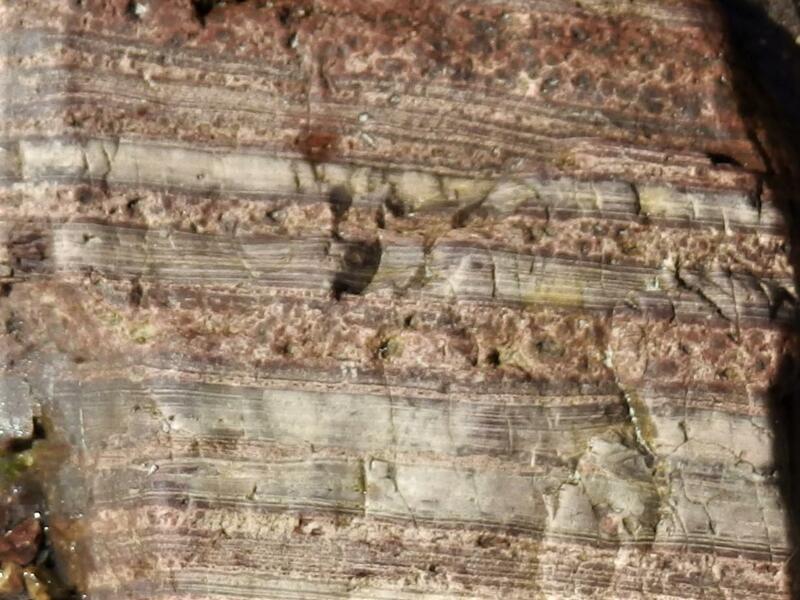 There are three conglomerate units in Jersey, the main one being the Rozel Conglomerate Formation, the others are L'Homme Mort Conglomerate, an interformational one in the St. John's Rhyolite Formation lying unconformably on andesite and the Jersey Shale Formation, and one named Association I which crops out in three places in the Jersey Shale Formation (Bishop and Bisson, 1989, p. 9). The Rozel Conglomerate Formation crops out in the north eastern part of Jersey and forms a shallow syncline plunging gently to the north east. The junction with the underlying Bouley Rhyolite Formation extends from La Tête des Hougues on the north coast south eastwards to the southern part of St. Catherine's Bay on the east coast. The basal beds are red sandstones, siltstones and microbreccias on the beach below La Tête des Hougues but the junction is obscured by recent clays on the beach south of St. Catherine's slipway. Similar beds occur at La Solitude Farm and two other isolated outcrops are shown on the map. They are overlain by many different unsorted conglomerate units with intraformational sandstones and grits which are described fully by J. Renouf (Bishop and Bisson, 1989, p. 40) and Went and Andrews (1990, p. 293). 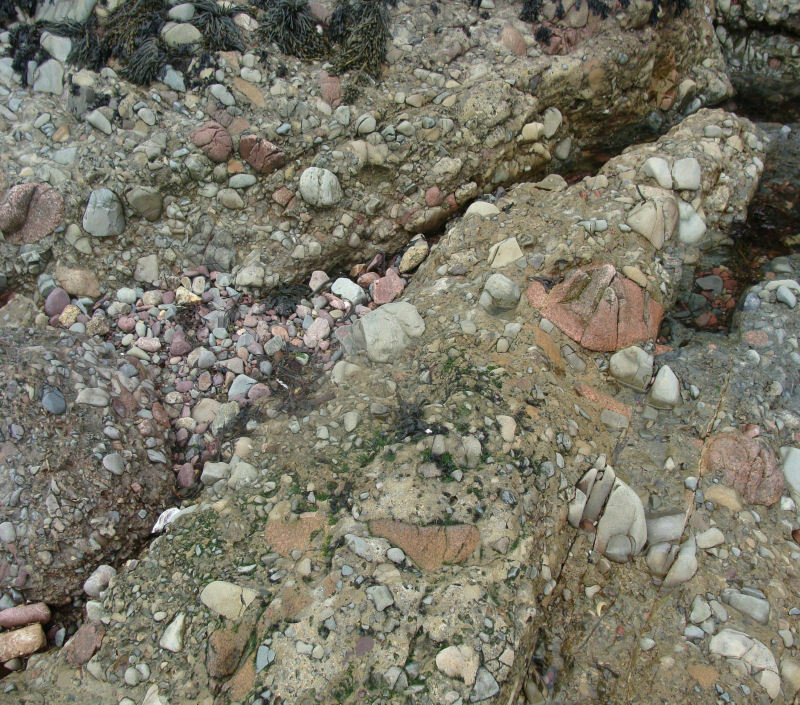 Conglomerate above basal beds, below La Tête des Hougues, and obscured by variegated clays, St. Catherine's Bay, but overlying beds well exposed nearby. Outliers occur in Les Hurets Valley, west of Bouley Bay and at La Pierre de Fételle above Vicard Point on the north coast and unusually, there is also a small, irregularly shaped, isolated mass which occurs in a gully in the granite between Seymour Tower and La Rocque Point on the south east coast. Isolated mass near Seymour Tower. This mass seems too large to have been ballast, and although probably eroded into its present shape seems unlikely to have been part of a dolmen. It was first reported by Noury (1886, p. 76), later mentioned by Marett (1911-12, footnote, p. 230), Sinel (1923, p. 93), Burdo (1929, pp. 202-5) and Hawkes (1937, p. 287) and recently shown to me by Dr. Arthur Hill (pers. comm.). Noury (1886, loc.cit.) considered it to have been dropped from a barge during an accident, whilst en route for use as ornamental stone for grottoes, garden ornament or tombs/graves as happened at times, rather than it being an outlier... "car il n'aurait pas resisté, sous sa forme actuelle, au milieu de cette plage granitique" implying it would have been eroded. The later authors although quoting the idea, seemed to show some reservation. Marett (1911-12, loc.cit.) in discussing capstones, concludes his footnote on Noury's statement with an exclamation mark... "dropped out of a barge by someone who intended to build a grotto or decorate his garden with it!" Sinel however (1923, loc.cit), describes at "La Rocque point... "a block of hard conglomerate - or rather, volcanic agglomerate - of St. Catherine's" (his interpretation of the Rozel Conglomerate as a volcanic agglomerate is argued in his earlier book, The Geology of Jersey, 1912, p. 15-19, where he discusses Noury's interpretation). Sinel goes on to state that because of its shape, size and position... "on a slight elevation of an otherwise flat shore, and with remains of submerged forest around it - that it is the capstone of a dolmen; whilst among the large blocks of granite scattered around, it is not difficult to trace its once supporting pillars". Burdo (1929, loc.cit), in describing blocks of stone found off La Coupe Pt. and again discussing their use as capstones states that a shipwreck is an unlikely explanation and states that Noury... "l' admet, faute de mieux" for the 'loss from the barge' explanation. This however, does not appear in Noury's text which gives a reasoned elimination of other possibilities. Hawkes (1937, loc.cit) describes the situation in the same terms, citing the above references and continues as follows; Â“It is possible that it may represent part of a submerged megalithic monument of some kind, but it is more likely to be a block dropped from a barge in transit from some coastal quarry. Finally, Stevens, Arthur and Stevens (1986 map 11C) record, in a list of reefs and rocks off the southeastern coast, the name Les Marins against which is written "megalith dropped from barge here" which might lead one to think the authors were referring to this block of conglomerate. In the same list however, there is also a 'La Maraine' reef, and in the preparation notes by the authors (unpubl.) with La Société Jersiaise, Lord Coutanche Library, it is stated "La Mar(r)aine Reef, SE of Karamé 1867 - shown as Les Marins in 1843".The 1868 Admiralty Chart shows La Maraine reef, 28-29 cables (c. 6km) at c. 100° (M) from Seymour Tower (and on the Admiralty Leisure chart, 5th Ed. 2006, number 5604.13 as 5km). 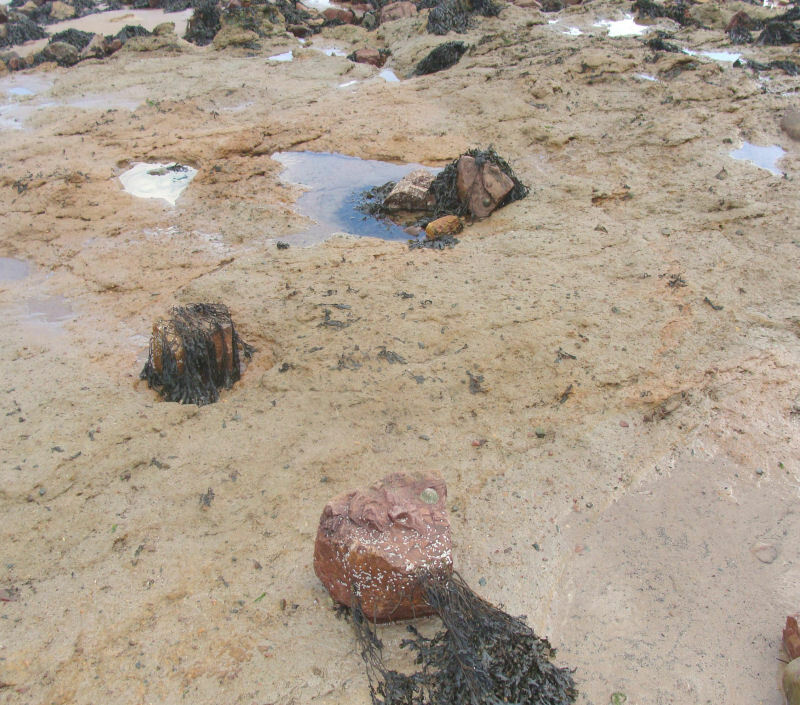 However, neither this small reef nor the adjacent seabed is exposed at MLWS, so at present it seems that this megalith does not refer to the mass of conglomerate and the above statement may have been obtained from a published article. The search for the 1843 chart continues but maybe the best way to resolve the "outcrop's" origin is to excavate its base in order to determine its resting attitude... if we can dig fast enough and prevent residual water from surrounding the site... because the implication that it would not have resisted erosion might depend on its original volume, area and location on/in the granite topography. The basal red beds of the north eastern mass rest upon the eroded surface of the Bouley Rhyolite Formation in the small bay below La Tête des Hougues and consist of red siltstones, sandstones and microbreccias (grits) which are graded. 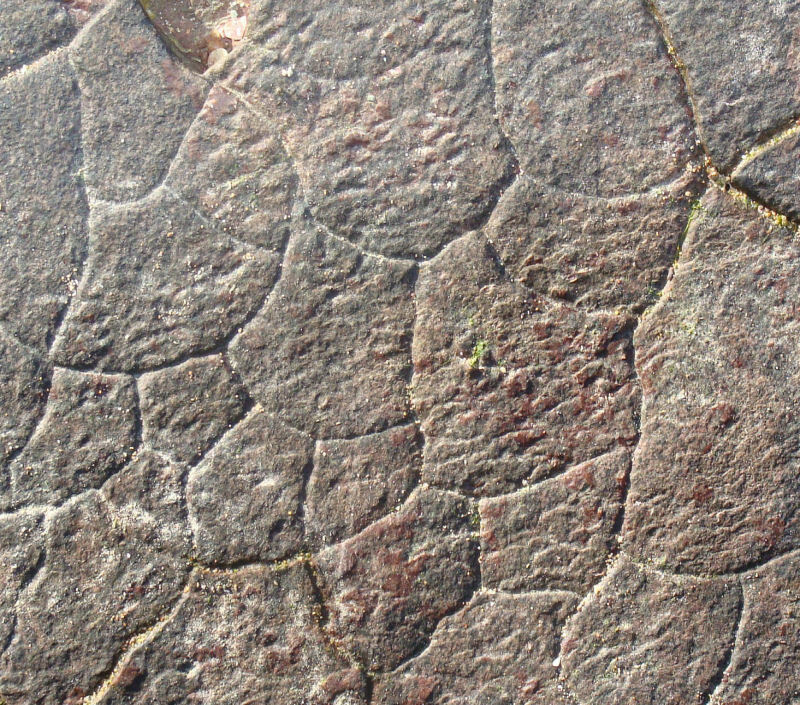 The most obvious structures in the red siltstones are polygonal cracks, few of which show infill from overlying beds. They are thought to be dessication cracks (Nichols & Hill, 2004. p. 80-81). 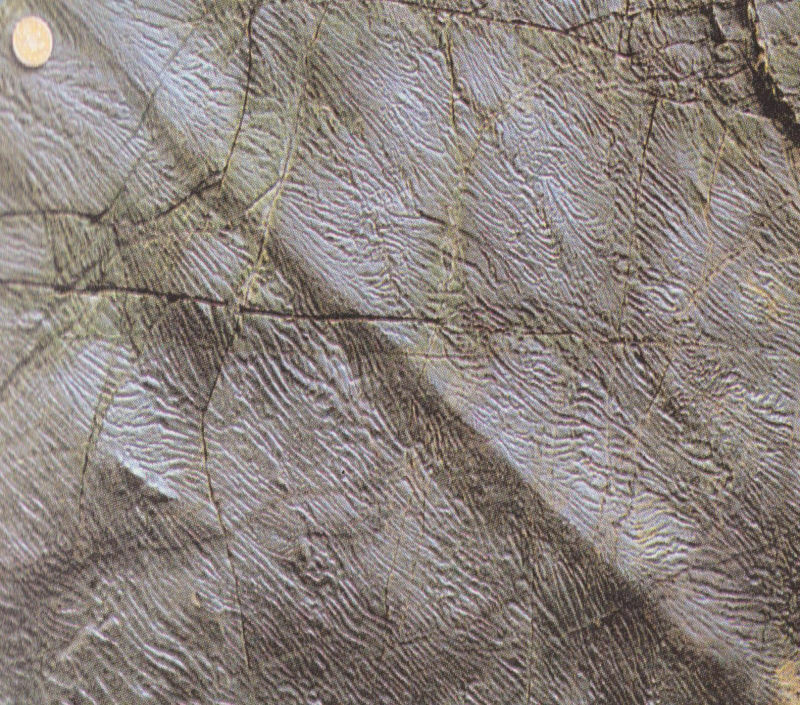 The bedding surfaces are uneven in part with low rises and hollows, and some show pits (possibly representing rain drop marks), grooves, and wrinkle structures (narrow longitudinal ridge and furrow marks). 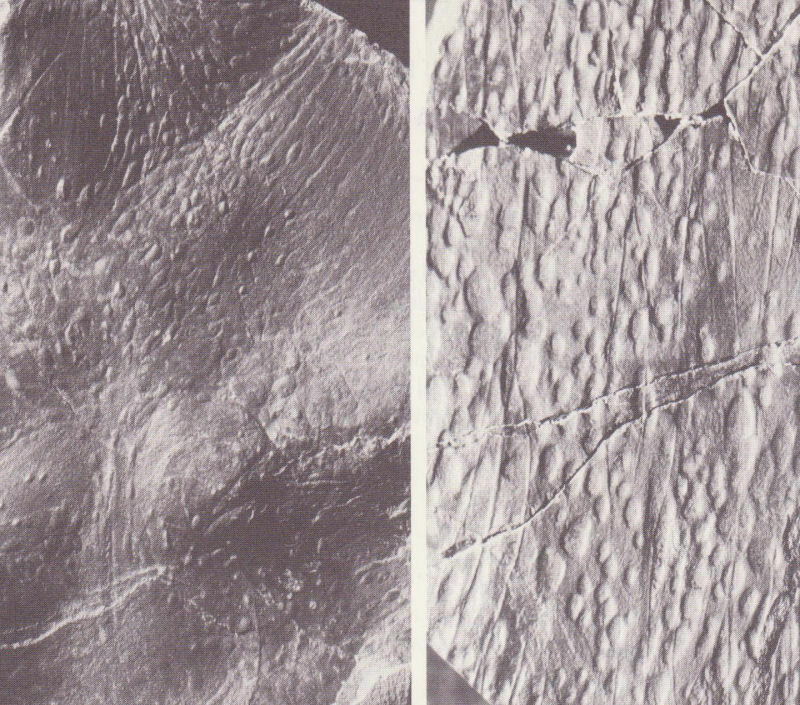 The last were described by Mourant (1933, p.296) as rill or ripple marks. However, they may represent organic evidence; Bishop & Bisson (1989, p. 40) mention a possible palaeontological indication of age by Bland (1984) with reference to the 'large impression fossil Arumberia Glaessner & Walter' and these sedimentary structures. The absence of Arumberia photographs in the Bishop & Bisson description (loc.cit.) which would have permitted comparison with those in Nichols & Hill (loc. cit.) intrigued me, and my personal lack of the papers by Glaessner & Walter and Bland was gratefully remedied by a contact from Ben Bland who kindly sent copies of both and opened up discussion. Planned visits to take photographs of the structures below La Tête des Hougues occurred recently; the results and outcrop observations are included below, followed by some discussion, and previous statements (obtained from the Internet) have been eradicated. The scale is x1. 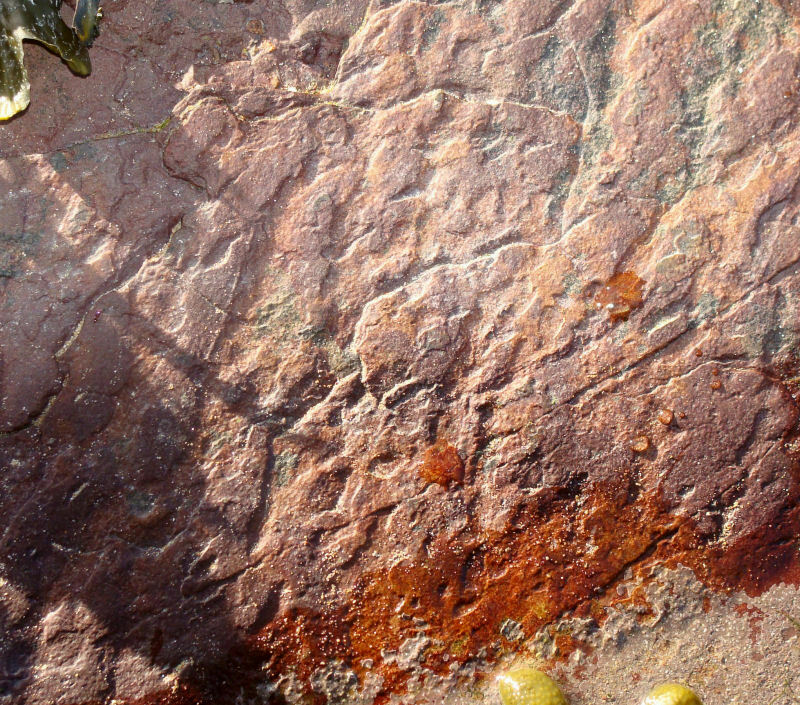 Red siltstone with cracks, pits and raised spots; grey siltstone with irregular shaped 'highs', some long and narrow ones (?trails), and fewer cracks; overlying grit bed (right) and underlying (left). 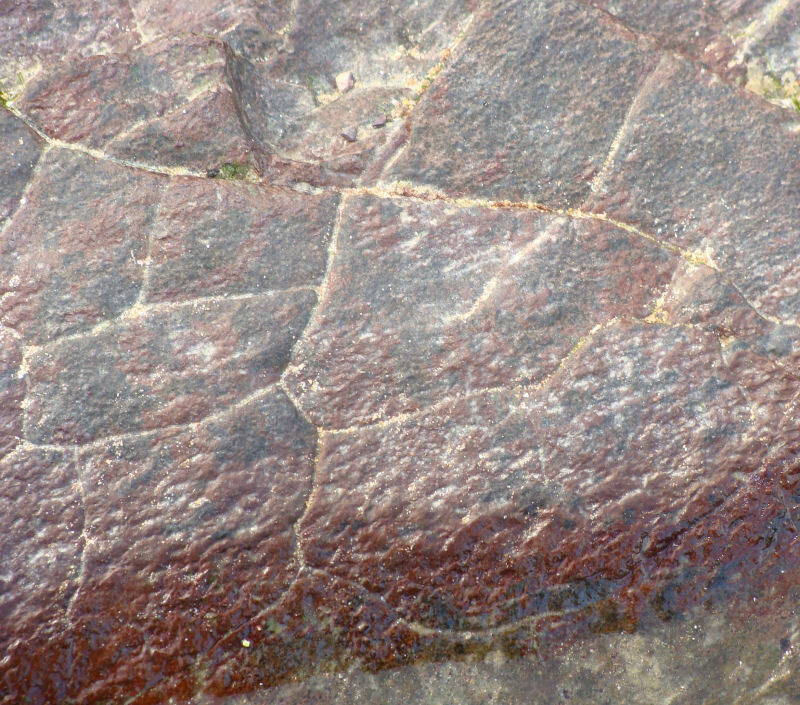 Red siltstone with infilled cracks and with cracks and wrinkles. Red siltstone with cracks broad furrows. Grey siltstone with cracks, 'wrinkles' & grit. Briefly, Arumberia Glaessner & Walter is described as Arumberia banksi gen. and sp. nov. which had a ribbed appearance of narrow grooves and ridges radiating from centres and occurring on bedding plane surfaces and as sole marks in the late Precambrian part of the Arumbera Sandstone of Central Australia. Its varied appearance and mode of life are pictured and described in comprehensive detail by M. F. Glaessner & M. R. Walter (1975, p.59-69). Two have been selected to show the 'ridges and grooves' respectively (loc.cit p.62). Pictures A & C from the Arumbera Sandstone (Glaessner & Walter, 1975, p. 62) by kind permission of Malcolm Walter. Scale c. x 0.25 & 0.33 respectively. Bland also presented the interpretation difficulties (loc. cit. p.630) and discussed the alternative interpretation by current vortices from comparison with structures produced in the flume experiments of Dzulynski & Walton (1965). However, he reached the tentative conclusion that the structures represent a colonial organism, Arumberia. Subsequently, the original biogenic interpretation by Glaessner & Walter was reconsidered in favour of an origin as a sedimentary structure (McIlroy & Walter, 1997, p. 79-80) as the experimentally produced flutes of previous authors "have striking resemblances to A. banksi". ** It is emphasised that the above examples are only presented to afford surface comparisons with the Rozel Conglomerate basal bed structures; no thin section work or other analyses, eg. of form, concentration or orientation have been done. 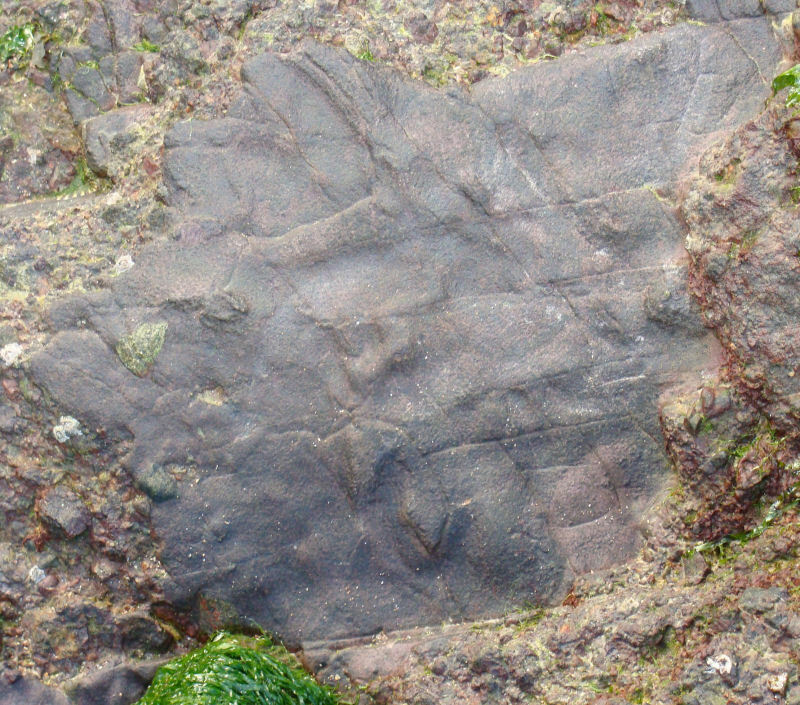 Longitudinal scour marks, Hartland Quay, Devon, UK (Roberts, 1996, p. 45, fig.43); by kind permission of Mrs. Jessica Roberts. There is a great deal more detail and discussion in the papers of the above authors and many more reference papers, for example, for the Longmyndian specimens, McIlroy, Crimes & Pauley (2005, Abstract on Internet) state that for "Arumberia ... its biogenicity is not accepted herein ... and is thus treated along with evidence for microbially bound sediment surfaces or matgrounds...". The study of ancient algal mat surfaces thus may open up a new field for the interpretation of the structures in the Rozel Conglomerate basal red beds and it may be that new samples could be examined with new technology which may reverse or confirm the results of the examination by Dr. Downie (Sheffield University) in 1964-5, when he concluded that the red shale sample from La Tête des Hougues was "completely barren" (Mourant, 1965, p. 22.). Note though, that this site is a proposed SSI.. These basal beds of the Rozel Conglomerate also need to be searched again to look for the spheroids illustrated and described by Bland (1984, p.626) from other areas, and found on a loose slab in our area (B. Bland pers. comm). These may be Leiospheres, spherical microalgae or algal microspheres ... work in progress. 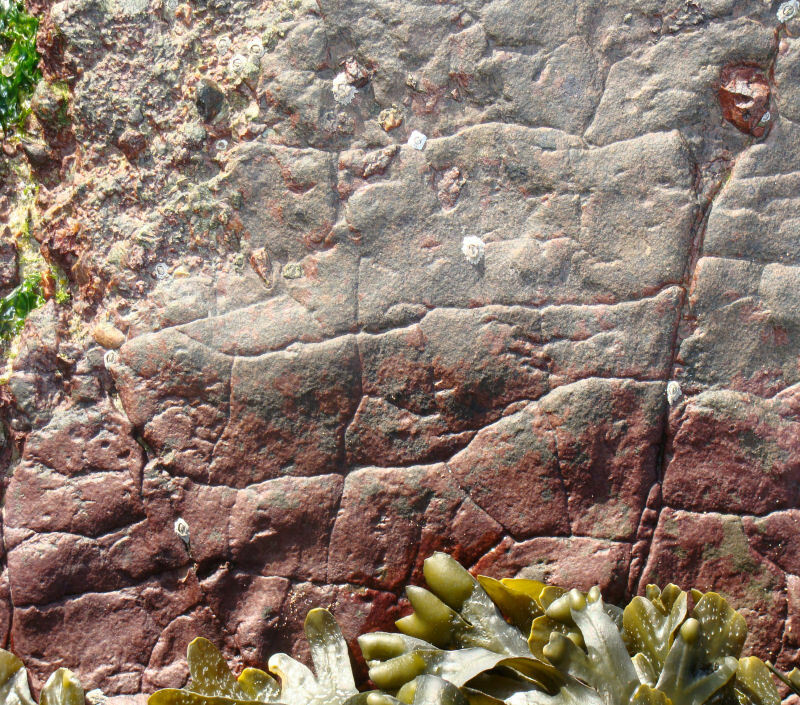 Elsewhere in Jersey, there are purple siltstones and conglomeratic beds at Solitude Farm and interbedded red sandstones and grit beds to the north of Bel Val Cove. Variegated shales, siltstones and unsorted conglomerate, La Solitude Farm. 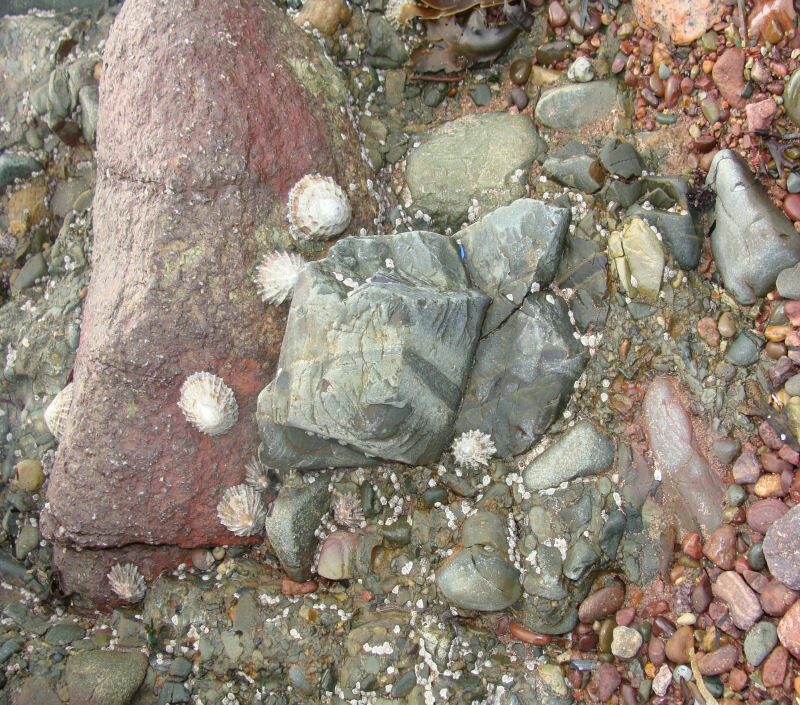 The pebbles in the conglomerates vary in size, shape, composition and orientation from small clasts, c. 1cm to large boulders c. 60cm and from rounded and sub spherical to sub angular and blocky in shape. 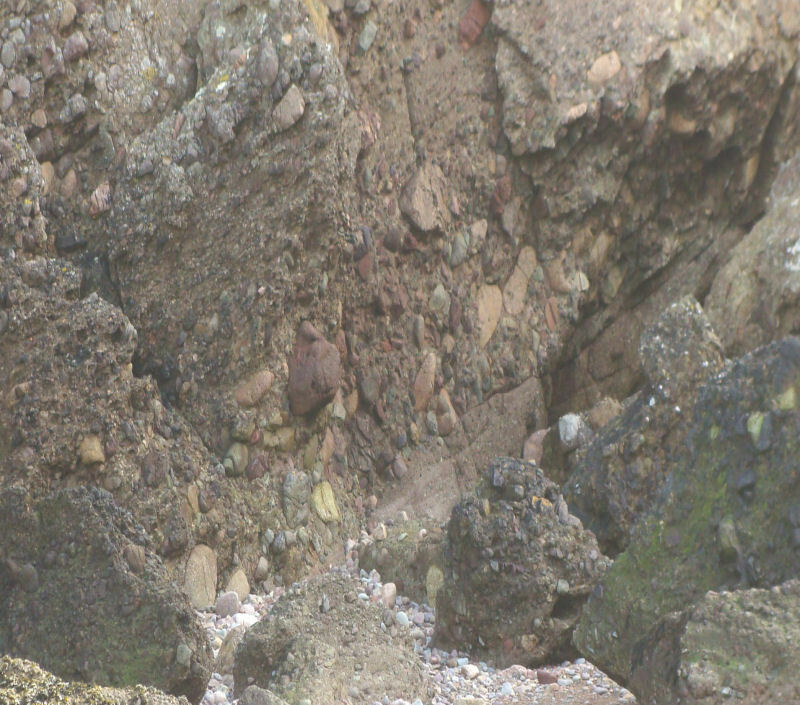 Composition varies from Jersey volcanic rocks and shales to granite pebbles, though not from the Jersey granites, and polymict pebbles showing reworking within the sequence. Various granite, rhyolite and shale clasts and large granite clast alongside shale with sedimentary structures, St. Catherine's slipway. 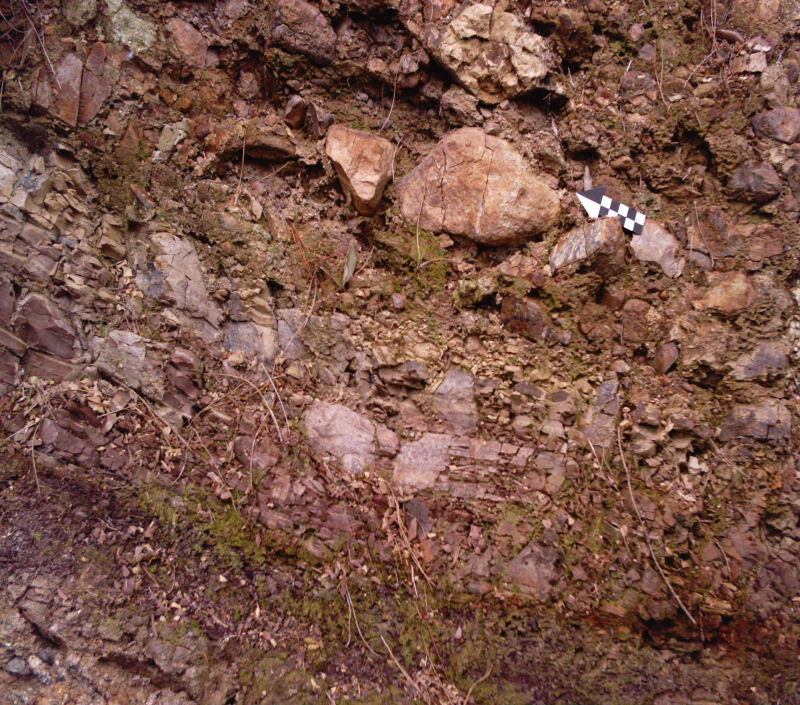 The pebbles are unsorted in often faintly stratified layers of varying thickness, with rare grading and imbrication although the pebbles have also been affected tectonically. 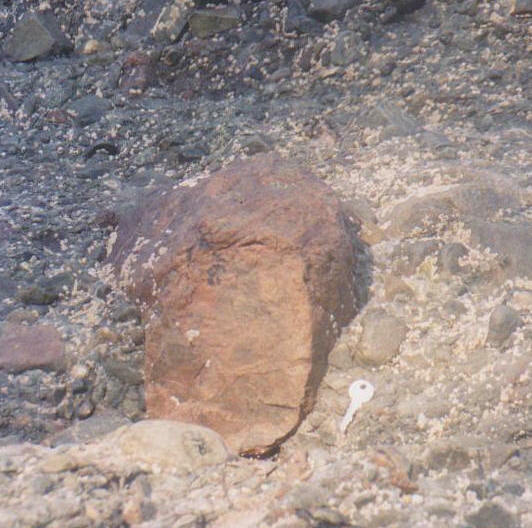 The larger boulders are blocky in some places and cut vertically across the bedding (see figure above). In the outliers above Vicard Point, their relationship to the eroded surfaces below may indicate cut and fill structures in channels approaching gullies in size. The palaeocurrent directions in some of the cross-bedded sequences, corrected for tectonic dip, show a northern provenance from an inferred highland area maintained by an active fault system, Le Ruau Fault (Renouf & Andrews, 1996, p. 22) but no known northern rock types, eg. from Les Dirouilles or Les Écréhous or Sark have been found, only those from the Jersey succession. The textures, structures and fabrics indicate that the conglomerates were deposited as alluvial fan deposits from flash floods within an intermontane basin striking east-west in a highland area named "Domnonaea" by Went and Andrews (1990, p.293). Their age lies between c.522 Ma, a date from within the St. Saviour's Andesite (850m thick) west of St. Helier in the Jersey Volcanic Group, which is either an eruption age or the intrusive age of a nearby granite (Bishop and Mourant, 1979, p.58), and 435 Ma for a hornblende lamprophyre dyke within the Rozel Conglomerate. With the thickness of 1380m for the Rhyolite Formations plus the thickness of andesite overlying the dated sample, the age of the conglomerates is possibly around 450 Ma, ie. Ordovician in age. Bishop, A. C. & Mourant, A. E. 1979, Discussion on the Rb-Sr whole rock age determination of the Jersey Andesite Formation, Jersey. C. I. J. Geol. Soc. London, Vol. 136. p.121 - 122. Bland, B. H. 1984. Arumberia Glaessner & Walter, a review of its potential for correlation in the region of the Precambrian - Cambrian boundary. Geol. Mag. Vol. 121. No. 6. p. 625 - 633. Burdo, Ch. 1929. Restes d'un monument mégalithique à la Pointe de la Coupe. Bull. Ann. Soc. Jersiaise, 11, 2. pp. 202 - 205. Glaessner, M. F. and Walter, M. R. (1975). 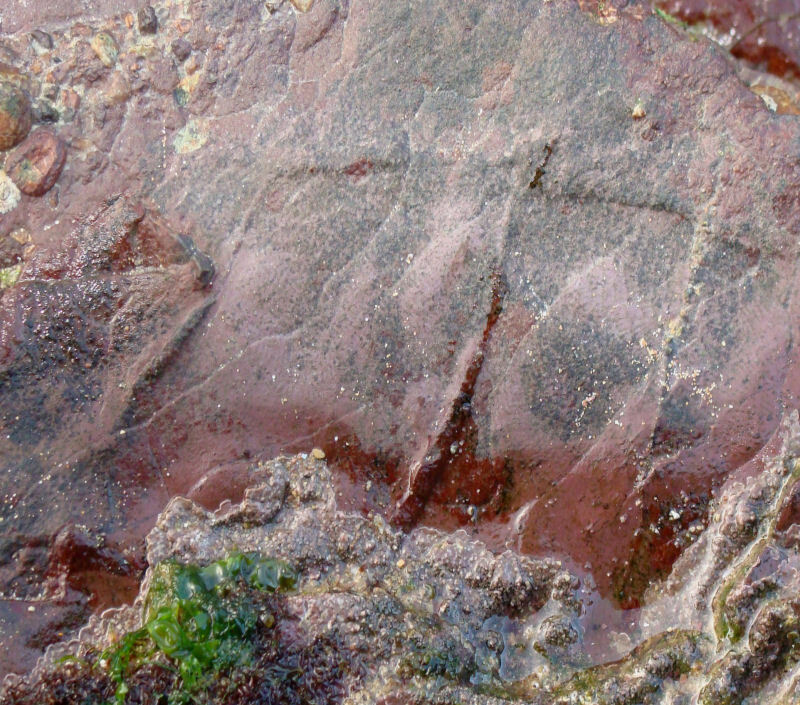 New Precambrian fossils from the Arumbera Sandstone, Northern Territory, Australia. Alcheringa: An Australasian Journal of Palaeontology, 1:1, pp. 59-69. Hawkes, J. 1937. The Archaeology of the Channel Islands. Vol. II, Jersey. Soc. Jers. Marett, R. R., 1911 - 12. Further Observations on Prehistoric Man in Jersey. Archaeologia. Vol. LX111, p. 204 - 230. McIlroy, D., Crimes, T. P. & Pauley, J.C. 2005. Fossils and matgrounds from the Neoproterozoic Longmyndian Supergroup, Shropshire, UK. Geol. Mag. Vol. 142, p. 441 - 455. McIlroy, Duncan and Walter, Malcolm R. (1997). A reconsideration of the biogenicity of Arumberia banksi Glaessner & Walter. Alcheringa: An Australasian Journal of Palaeontology, 21:1, p. 79-80. Nichols, R. A. H. 2013. 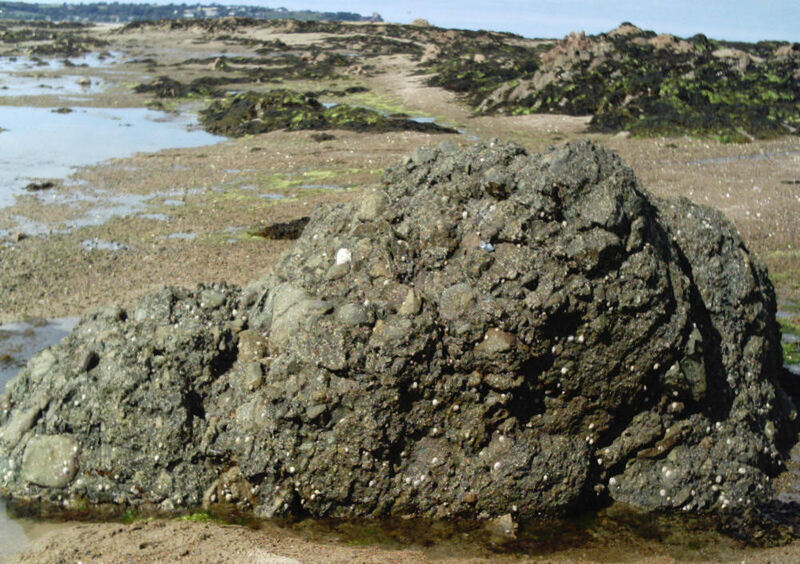 Rozel conglomerate at La Rocque - Seymour: Megalith, Boulder or Outlier? Ann. Bull. Soc. Jersiaise. 31. 1. p.81. Nichols, R. A. H., & Hill, A. E. 2004. Jersey Geology Trail. Private publication printed by the Charlesworth Group. Renouf, J. T. 1989. 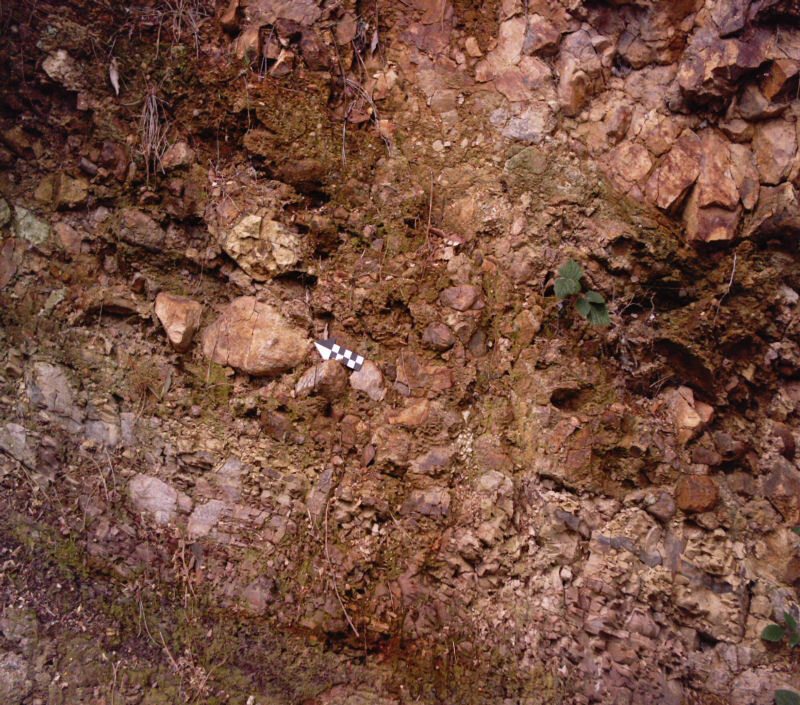 Rozel Conglomerate Formation. In Bishop. A. C. and Bisson, G. 1989. p. 40. Renouf, J. T., & Andrews, M. 1996. Geology, pp. 17 - 22. In Les Écréhous, Rodwell, W. 1996. Société Jersiaise. Roberts, J. L. 1996. The Macmillan Field Guide to Geological Structures. Macmillan Reference Books, Macmillan Publishers Ltd. London and Basingstoke. Sinel, J. 1912. The Geology of Jersey. J. T. Bigwood, States' Printer, Jersey, CI. Sinel, J. 1923. Prehistoric Times & Men of the Channel Islands, 2nd Ed. J. T. Bigwood, States' Printer, Jersey, CI. Went, D. and Andrews, M. 1990. Post-Cadomian erosion, deposition and basin development in the Channel Islands and northern Brittany, pp. 293 - 304. In: D'Lemos, R., Strachan, R. S. and Topley, C. G. (editors). The Cadomian Orogeny. Geological Society Special Publication No. 51. The Geological Society, London.